The all-new 2016 Honda Pilot makes its debut in an integrated advertising campaign that touts the perfect family vehicle with room for everyone to grow. The memorable campaign features captivating computer-generated imagery to showcase functionality in TV and uses this same look across digital and print, as well as music from Grammy-winning rock band Weezer to spark interest in a second TV spot. The centerpiece of the campaign is "The Incredible Pilot Elite," which uses a unique blend of practical and CG to demonstrate the new styling and high-tech features of the all-new Pilot through different scenarios in an eye-catching way. 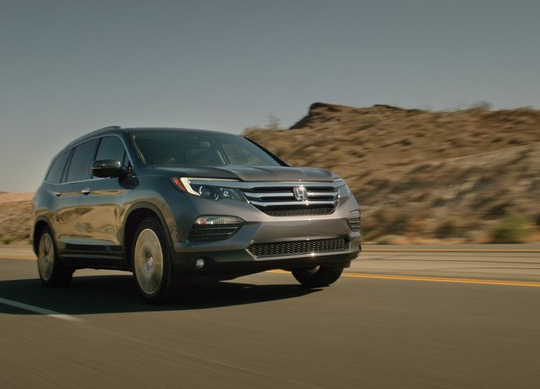 The spot shows the interior spaciousness and versatility of the Pilot to accommodate growing families. An additional 30-second spot for the LX model will fit together and become a long-form piece. A second supporting spot called "Even Better," directed by award-winning director Jason Reitman (Up in the Air, Juno), speaks to shared family moments. "Even Better" features a classic song, Weezer’s "Buddy Holly" that will resonate with parents and kids alike. The first notes are immediately recognizable by Honda’s target buyers who now have families of their own, and who remember that song from happy days of their youth. "The campaign leverages the Pilot's strengths with two impactful spots, showing that the Pilot is 'Ready for Anything.' With its all-new styling, premium technology and adaptability, it's the perfect vehicle for everyone," said Jeff Conrad, senior vice president and general manager of the Honda Automobile Division of American Honda Motor Co., Inc.
On TV, the creative will be heavily slotted in Cable, LateNight and Early Morning, and in the Fall, Pilot will also air on CBS NFL, ESPN NCAA Football and ABC/ESPN NBA. To reach consumers online, there will be video on YouTube, Yahoo!, and Windows 8, Digital Roadblocks on both YouTube and Yahoo!, plus additional exposure with digital partnerships such as Amazon, IMDB, TripAdvisor, Pinterest and XBOX. Pilot will also have a presence in major print publications such as Road & Track, Autoweek, MotorTrend and more. Honda offers a full line of reliable, fuel-efficient and fun-to-drive automobiles for American car buyers through approximately 1,000 independent U.S. Honda dealers. The Honda lineup includes the Accord, Crosstour, Civic, Fit, CR-Z and Insight, along with the Pilot and CR-V sport/utility vehicles and the Odyssey minivan. Honda has the longest-lasting cars1 of any mainstream automotive brand in America, and more models achieving an IIHS TOP SAFETY PICK+ rating than any other automotive nameplate. Honda has been producing automobiles in America for more than 30 years and currently operates 16 major manufacturing facilities in North America. In 2013, more than 94 percent of all Honda vehicles sold in the U.S. were made in North America, using domestic and globally sourced parts. 1 Longevity based on IHS Automotive, Polk U.S. vehicles in operation registration statistics 1988–2012 for Honda and non-luxury competing brands.